To benefit from expertise it has to be accessible, live, and transferrable. Capitalize on our expertise while fusing it with your own. Welcome to FuseExpertise, an Expertise as a Service™ platform (EaaS™). EaaS™ is the emergence of expert content on a simple to use platform which allows the users to deploy, utilize and execute upon the expertise. Our goal is for businesses to maximize Intellectual Productivity™, achieving greater efficiency and effectiveness with fewer resources. FuseExpertise is subject matter independent and can leverage all areas of business and personal improvement. If you want to disseminate expertise in a controlled manner to increase retention, accountability and execution we're the patented and patent pending platform for you. The range of benefit and opportunity is staggering - from internal processes, consultative sales, through to trickling expertise to your channels and end user markets. Our initial content release is in IT. Additional content for SMBs is also underway for financial, sales and marketing. Additionally, we have defined Intellectual Property & Innovation Management, Wealth Management, and Health Care and are seeking partnerships in these domains. IT professionals use our platform to provide assessments with interactive client benchmarks against IT Profit Practices™. 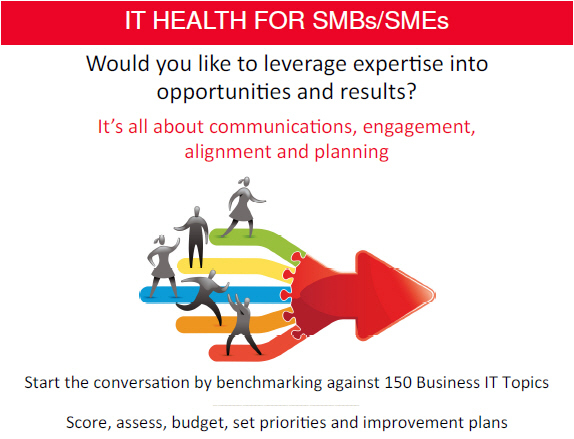 Together, the client team and the IT professionals assess, score, set priorities, budgets and actions plans, and have discussions around improvement. IT service providers not only establish an effective ongoing customer relationship, but also realize new revenue as clients face real and compelling reasons to spend money addressing IT priorities. IT managers see increases in budgets for the same reasons.The platform remains accessible by the client team to make advancements against the benchmark and scorecard, giving the IT professional a continual touch point with clients. The platform also provides the client team accessibility to a rich, yet focused, cluster of related IT Productivity content - available for employees to access, utilize and execute upon, using FuseExpertise EaaS™. Our best practices model can be applied to a number of other critical areas of business, in addition to IT - including financial health, sales, internet marketing and many more! Our FuseExpertise EaaS™ platform includes guides for the service professional on “How To” effectively use the best practices model to land, interact, retain and grow client revenues. Provide scale to your consulting practice and turn your expertise into an annuity and a consistent client engagement and improvement platform. Augment your expertise with high value, sector specific functionality, with low cost, low technological risk plugins that capture not just your expertise but your methodologies. Take your expertise and bring it to life, well beyond PDFs or ebook formats. Provide a whole new level of patented and patent pending functionality through collaboration, references, score carding, assessment, budget and tasks. Make your expertise scale by allowing you to attach objects and data partnering so a chapter or section on best practices for "the object of your expertise" becomes just that for all "objects of your expertise" whether the object is a person, a thing, a process, a building or a situation. Watch as your audience reads, assesses, discusses, sets priorities, and defines improvement plans. See hot spots of interest and activity and dark spots of disinterest - and invest in future efforts accordingly. Get to know your audience intimately through a state of the art audience engagement platform! FuseExpertise is the premier platform for Intellectual Productivity™ and maximizing expertise retention, execution and accountability. Experience the power of expertise, now! 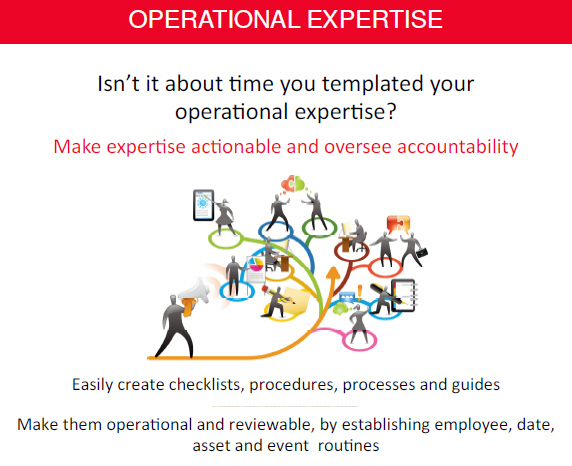 We’d like to introduce you to "IT Productivity Tips" on our FuseExpertise™ platform. 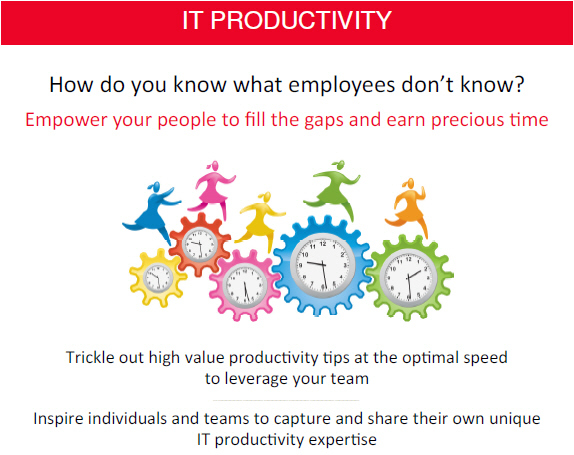 Research shows that the vast majority of employees are unaware of important productivity tips and many people report their IT experience as extremely frustrating. FuseExpertise will send one IT Productivity link to each of your subscribed users once a week. You will have your own dash board and you will be able to bookmark, set reminders, make your own notes or engage in discussions with your group.100's of important tips will be available to you and you can easily select and deselect categories of tips depending on your interests. What is terrific about FuseExpertise is that it allows you to capture and share your own expertise (be it IT or otherwise). Research also confirms that sharing expertise in the workplace is very limited and that how expertise is shared is not very effective. You can author your checklists, processes, procedures, instructions and guides in a more detailed way that you and others can share and put into practice. We hope you and your colleagues enjoy our IT Productivity content and the FuseExpertise experience.